Reverend Scarlett, Thank you so much for the wonderful ceremony!! We were so happy! I have received many compliments about your service. Honestly, we would not change a thing. Your input and guidance from the start was perfect. If you couldn't tell, Jeremy and I love each other very much and were/are soooo happy. Your blessing was fantastic (especially "Play Ball!"). So thank you again. Father Michael, Thank You so much for putting together such a beautiful ceremony for us. We feel so lucky to have found you, and are thankful you chose to spend your New Year's Eve with us. You will be a part of our memories to last a lifetime. Greg and I would like to thank you so very much for your beautiful ceremony on Saturday. Your humor and kindness truly helped to make our day everything we wanted it to be. We were definitely blessed to have you perform our marriage. We wish you all the best and you never know when we may see you again. Hi Reverend Michael, The ceremony was wonderful. You did a great job. Mike and I were extremely happy. 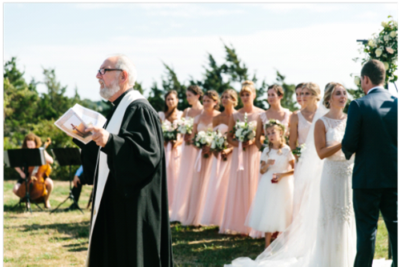 We couldn't have asked for a better Reverend to perform our ceremony. You were very accommodating from the start until the end. You were a blessing sent to us by God. You truly blessed our day and it showed by all the comments I received from our families/guests at the wedding. Great things happened the day of our wedding. You could truly feel the love between family. Certain family that hadn't talked for years (didn't get along) started hugging and kissing each other for the 1st time in a while. It was amazing you could just sense the love in everyone. I can't say enough good things about you. You were very helpful in everything. You answered our questions quick and prompt and was always available. You were truly a blessing to our special day. Mike and I wish you/family and ministry continued success. I wanted to thank you for the beautiful service you helped us create! there was not a dry eye in the place! We had no clue that would happen! To this day, I STILL have people telling me and my husband that our wedding was one of the absolute best weddings they have ever been to and a lot of that has to do with your ceremony, and how you lead us all! I know its late, but I wanted to say THANK YOU SO MUCH! Life is treating me and my husband well, and I hope you are in good health and good spirits! Again, from both Jeff and I THANK YOU for making our day sooo special! Thank you for the beautiful service. It meant a lot to me. It's been a very long time since I have felt close to God, but that connection came through on Saturday. I believe it was because of your words. I love this picture, one of my favorites. Thank you SO MUCH for being a part of our wedding day, it was such a beautiful day with much thanks to YOU. We would like to thank you for sharing this special day with us. We have been blessed by your love and support. Rev. Mike, Thanks for being part of our wedding and for adding to the happiness of our wedding day.